Are you looking for something exceptional to put you in the holiday mood? Planning a vacation to Florida, or already live here in the Sunshine State? 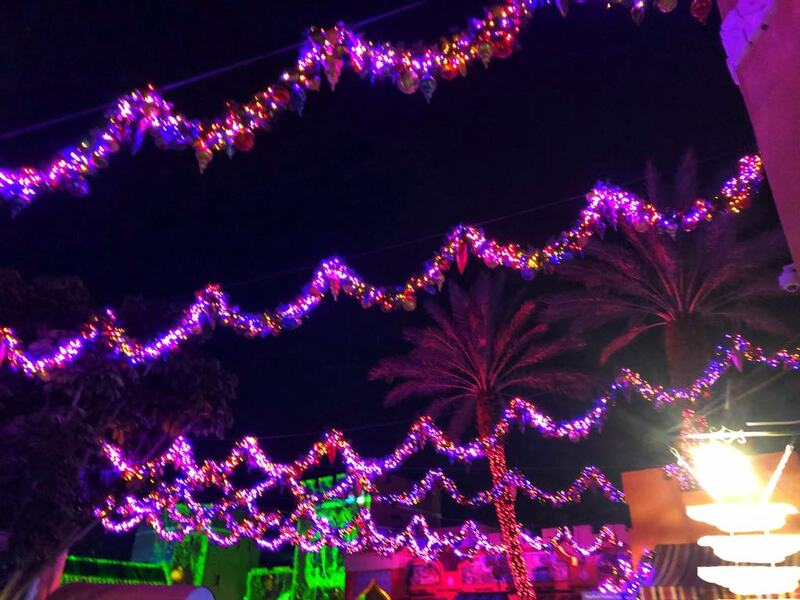 Well, look no further because I’ve got just the perfect place for you to visit: Busch Gardens Tampa Bay’s 2018 Christmas Town. 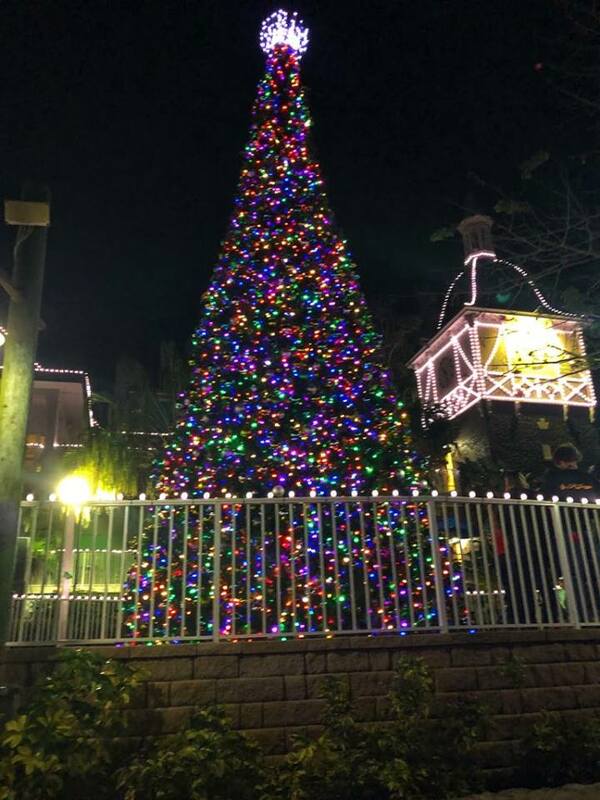 An evening at Christmas Town is exactly what you need to put you in a cheery holiday mood. 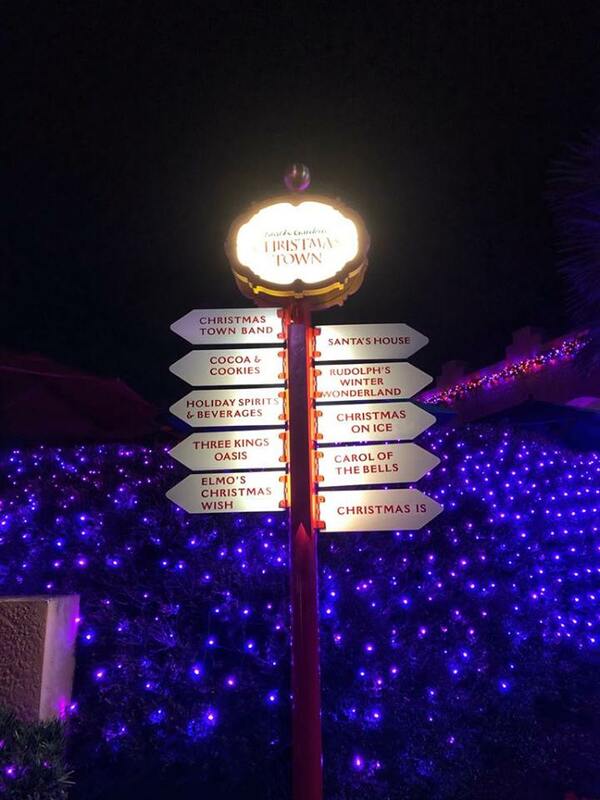 Here is a roundup of what a marvelous experience the 2018 Busch Gardens Christmas Town was for me. 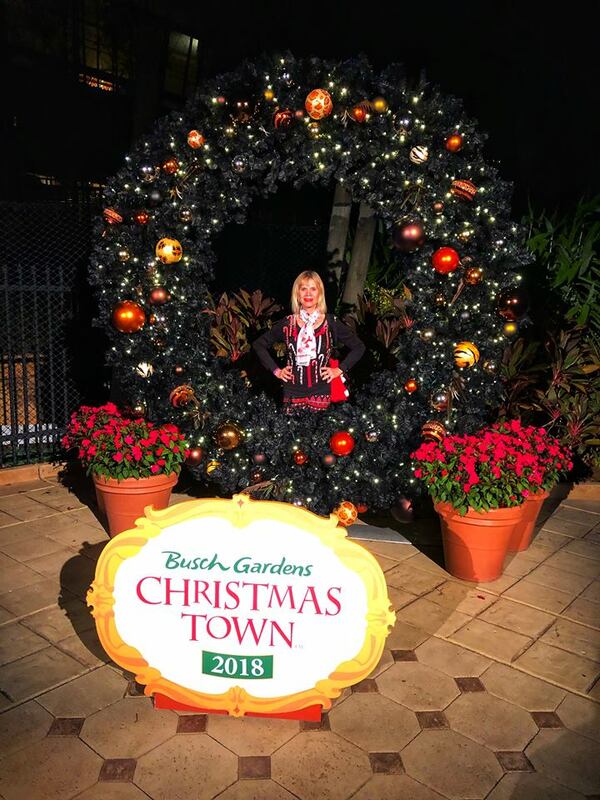 On a recent Saturday afternoon, my friend Christine and I headed over to Busch Gardens in Tampa Bay to visit their spectacular Christmas Town. Neither of us had ever experienced it before and we were very excited to see everything! If you plan to visit Busch Gardens Tampa Bay’s Christmas Town on a weekend day or evening, please leave ample time to devote to parking. It is such a memorable and popular attraction at Busch Gardens Tampa Bay and it gets very crowded on the weekends. Busch Gardens Tampa Bay parking is across a busy road, but there are very frequent shuttles to transport you and your family to the entrance gate under that busy road. Disabled and preferred parking are located adjacent to the entrance area. 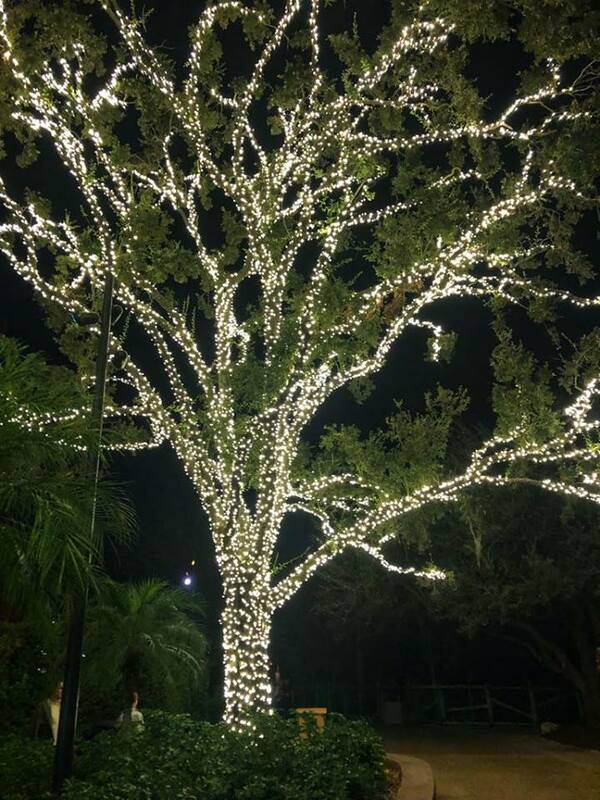 Right as you enter the front gate of Busch Gardens Tampa Bay you are greeted by a huge beautifully decorated Christmas tree! This is the epic Christmas tree that greets you upon your arrival. There are Busch Gardens photographers available to snap memorable family Christmas pictures worthy of your Christmas cards! Make sure to take advantage of their services. 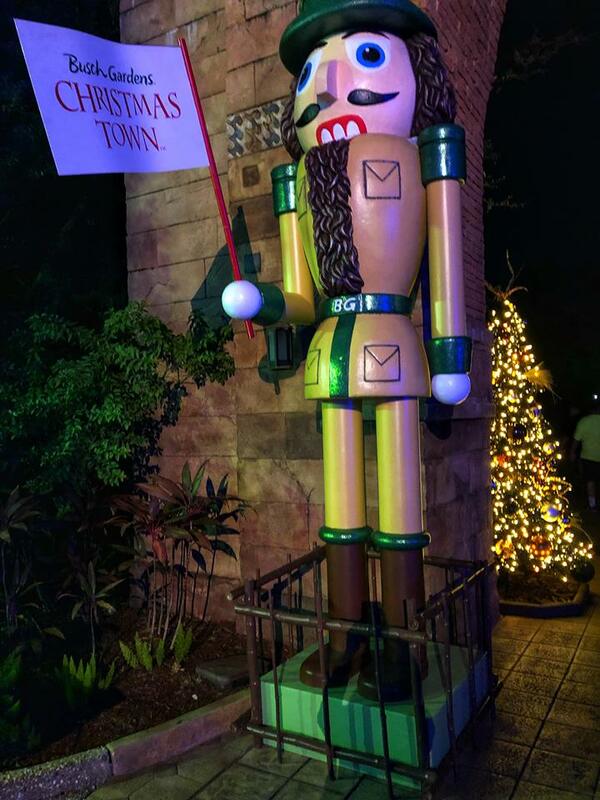 This handsome Nutcracker stands at attention to welcome all to Busch Gardens Tampa Bay’s 2018 Christmas Town. 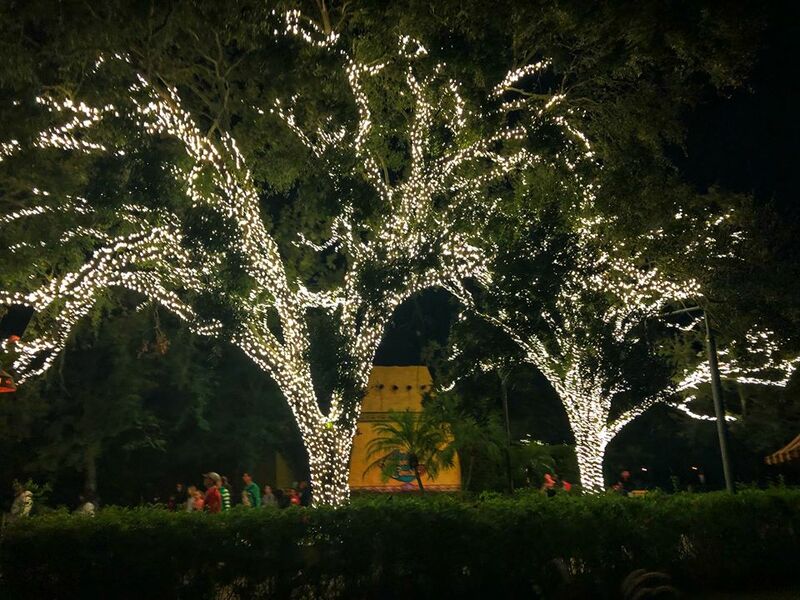 The entire Busch Gardens Tampa Bay park was adorned with twinking and festive holiday lights everywhere we turned. Like these brilliantly lit trees so bright and merry! I could not resist stopping and getting a ‘souvenir’ picture at this cool site. There was a long line of attendees who had the exact same idea. Everyone was in a great mood and were taking pictures of each other to help each other’s family out. 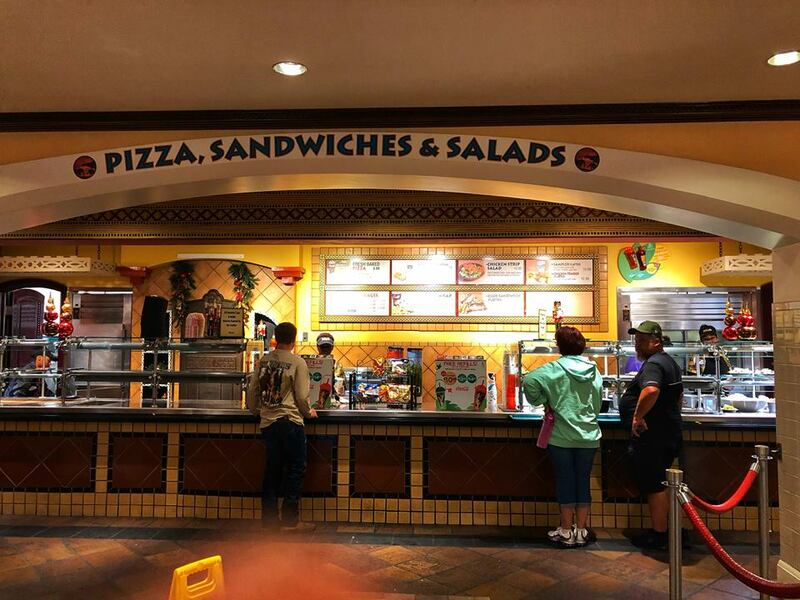 As we meandered around the park, we decided to stop and get a bite to eat at the Serengeti Overlook Cafe. Little did we know what was ahead of us! Every 10 minutes there’s a Carol of the Bells light show. The lights dance and change color in time to the music. It was very impressive. Since it repeats every 10 minutes, you don’t have to worry about missing on out this spectacular visual treat! This is how the Serengeti Overlook looked during the Carol of the Bells light show. Adjacent buildings were also lit as well. I can say it was truly magical. This is the magical Christmas tree greeting visitors when they enter the Serengeti Overlook Cafe for a bite to eat. It’s very impressive. Serengeti Overlook Cafe was a good choice for us to get a quick bite to eat. 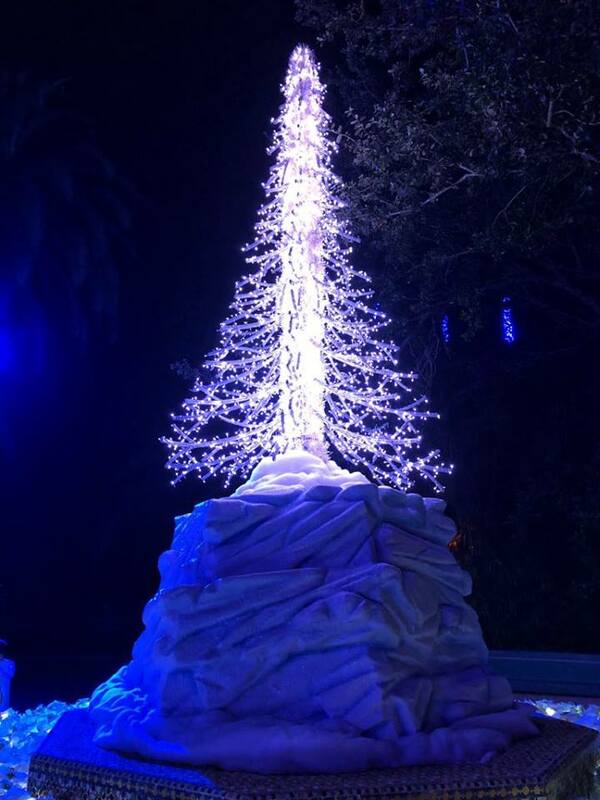 There was so much to see at Busch Gardens Christmas Town 2018 and we didn’t want to spend any time in a long line. The staff was excellent and soon we were again on our way exploring all the wonderful surprises in store for us after our great meal. 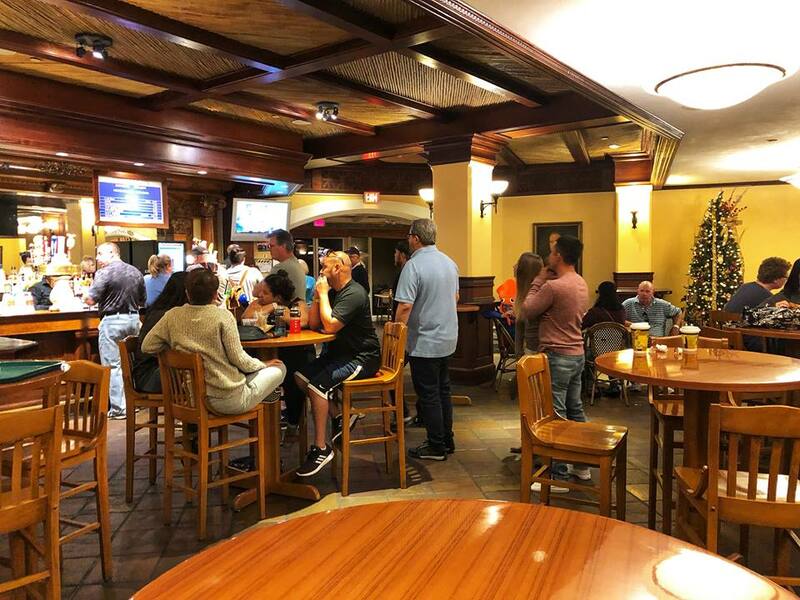 Busch Gardens Tampa Bay recently re-established an old policy whereby adult customers receive beer during their visit to the park as part of their paid admission. Here’s the lounge area of the Serengeti Overlook Cafe, full of visitors taking some time to enjoy a beer during their visit. Situated very near where we had dinner was the train station. 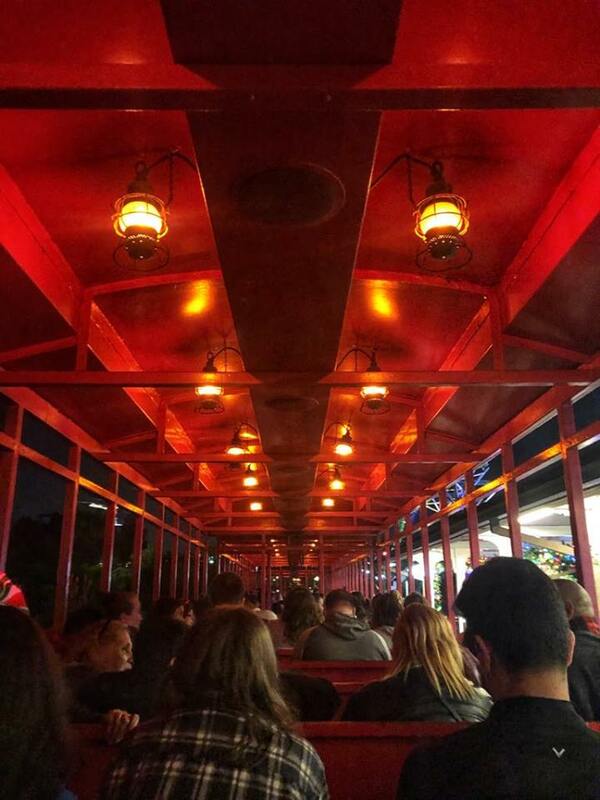 We heard train rides this evening were “sing-alongs” to Christmas carols. So we decided to join in on the fun. 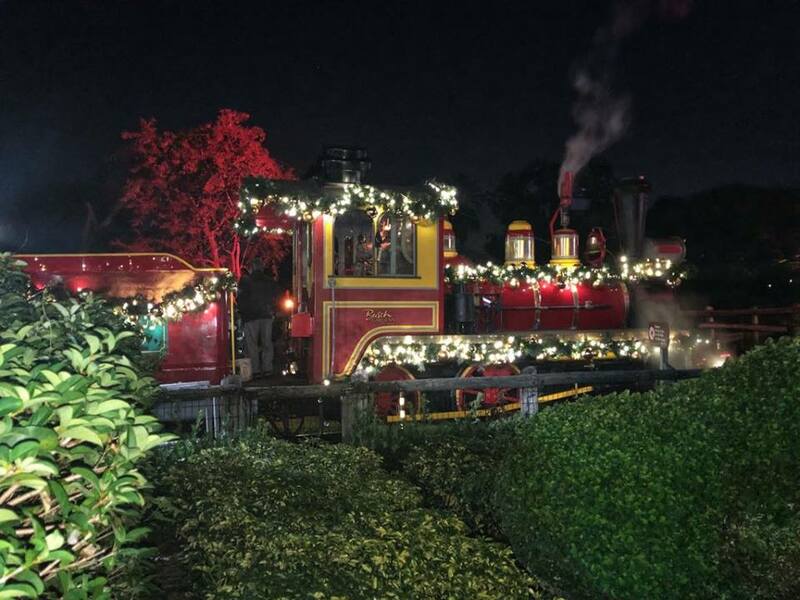 Look how absolutely festive the train engine was the day we visited Busch Gardens Christmas Town 2018! 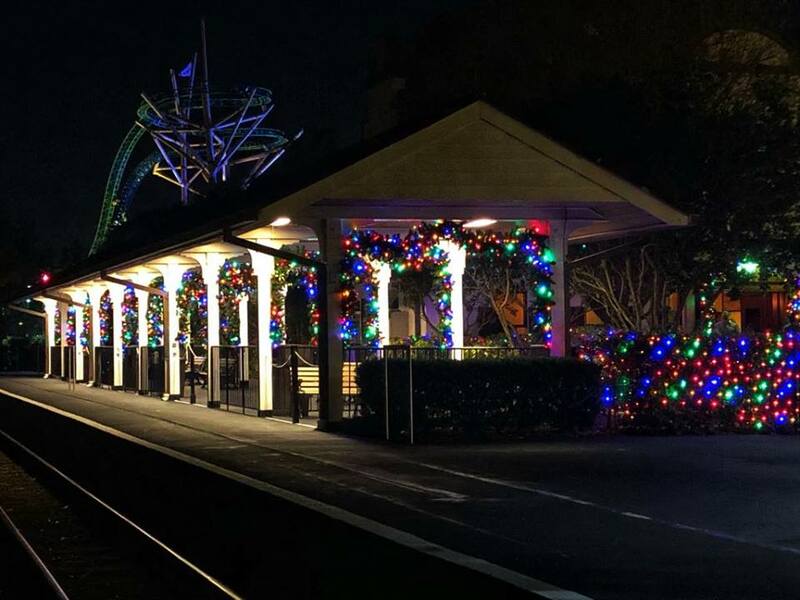 The train station was really decked out with all the holiday lights. That can put anyone in a cheery mood. Every seat on our train ride was filled to capacity with happy people singing merrily. I think the children riding had the most fun of all. I will admit this was my favorite thing we did when visiting Christmas Town 2018. The conductor led us all in the singing and it was very merry and jolly and fun. During our train ride around Busch Gardens Tamps Bay singing and laughing, we had the added bonus of seeing some of the wild animals that call Busch Gardens Serengeti Plain home. Giraffes and zebras were awake and moving about, and we could see them once our eyes adjusted to the darkness. It was really very cool. There were many signs all over the park indicating where other attractions were, such as this one. There was really so much to do it was difficult not to feel overwhelmed! Thank goodness for these signs. In addition to all the festive lights to look at and sing carols during a very cool train ride, there were lots of shows to see. There was the ever-popular and fantastic Christmas ice skating show and several holiday musical presentations. Elmo made his appearance and even some of the Busch Gardens animals had their own comedy show. I highly suggest you budget enough time to see all these great shows, which are spread out throughout the park. We headed to Santa’s House next. It was a very popular place and I’m sure you can guess why. There were lots of young ones waiting in line with their parents to share their Christmas wish list with Santa Claus. Christine and I chose not to see Santa, but we sure did admire all the glittery lights around his house. This simply Christmasy explosion of lights was on the way to Santa’s House. Epic. Wow! And look at this. Bright and cheery. 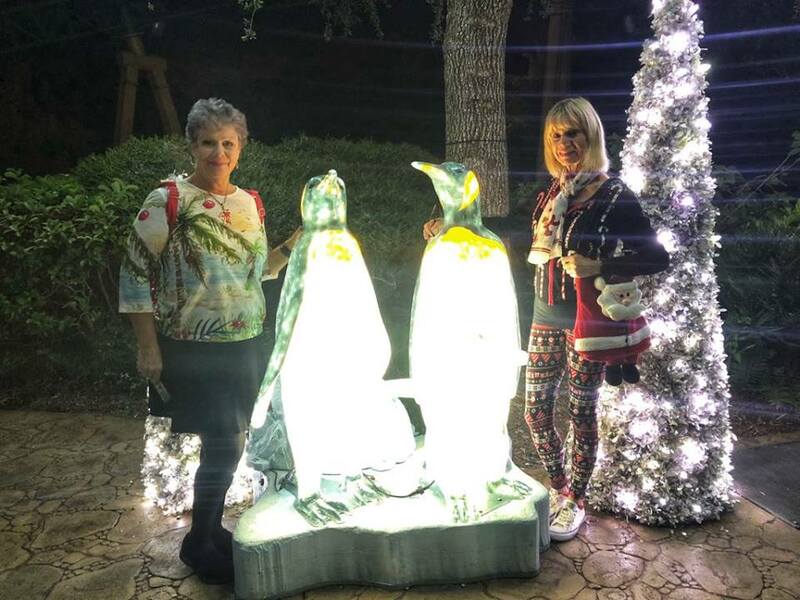 Here Christine and I are posing with the Christmas penguins. 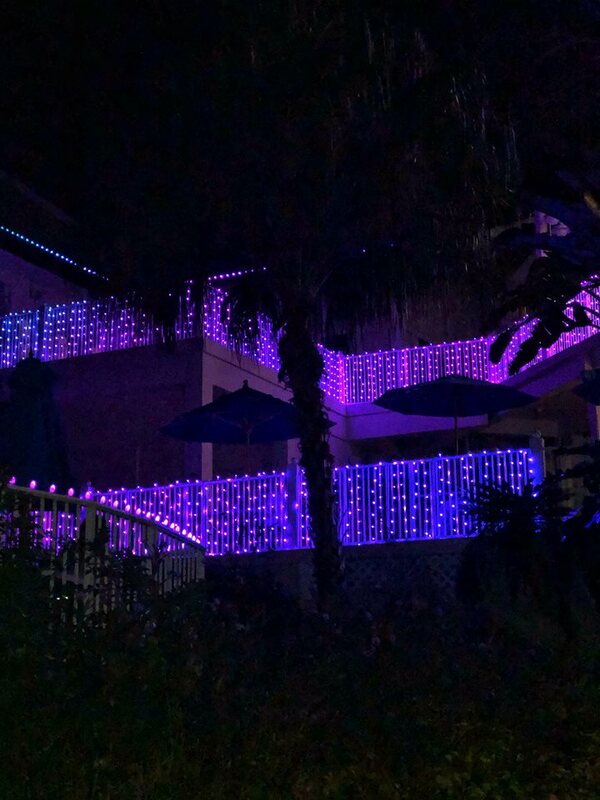 There were fantastic and elaborate holiday lights simply everywhere. 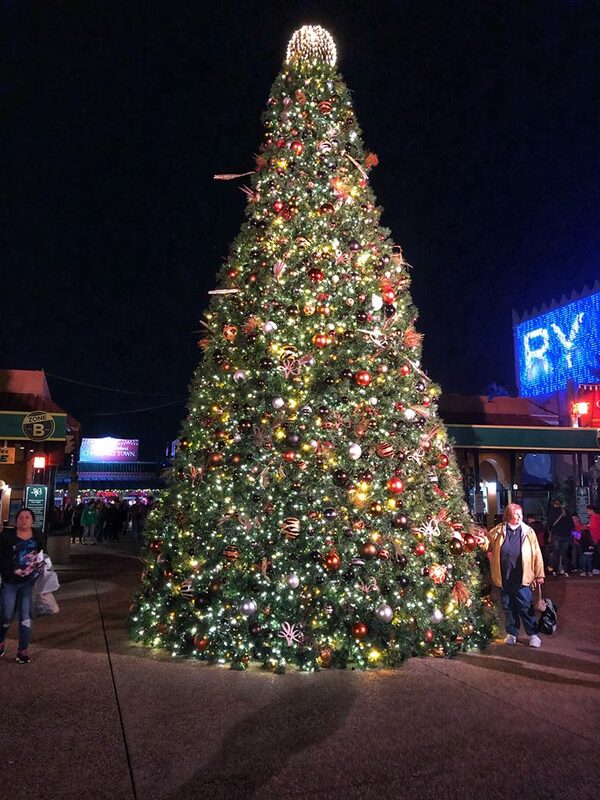 And finally, because all great things must come to an end, our night at Busch Gardens Christmas Town 2018 came to an end. 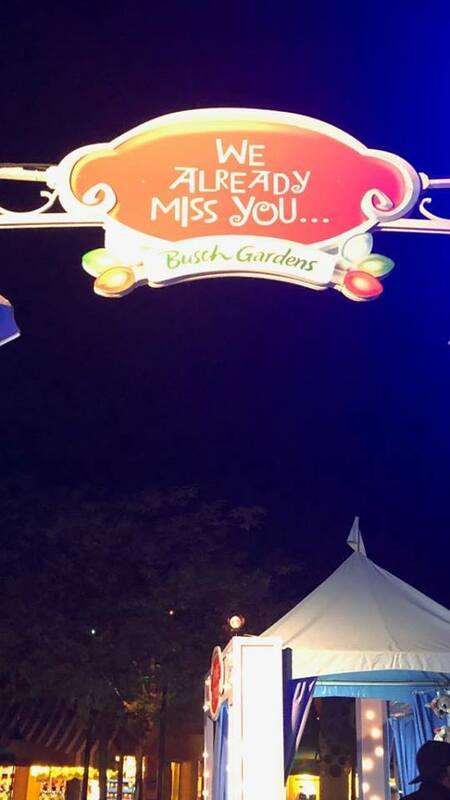 This sign in the park was a cute reminder that they would like us to come back and visit them soon. 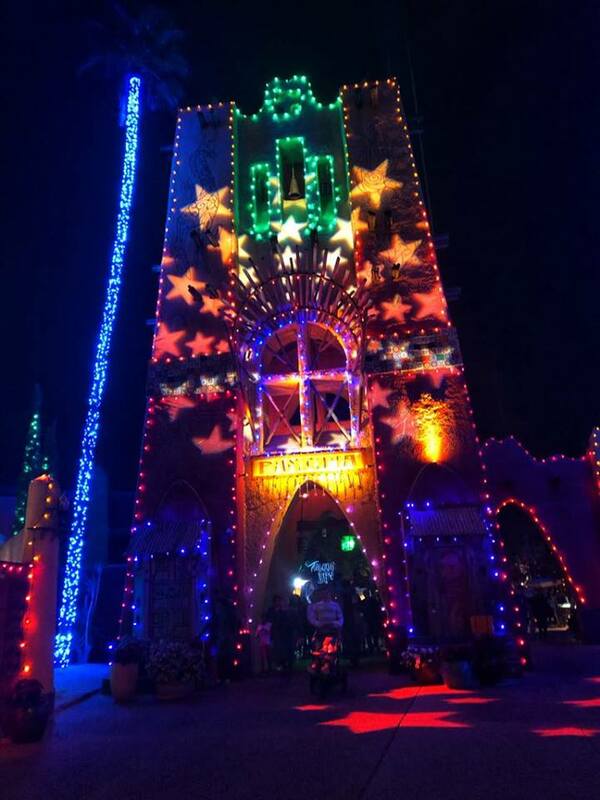 I highly recommend you visit Christmas Town 2018, at Busch Gardens Tampa Bay, now through the holidays. Make this a new family holiday tradition with wonderful memories that you and your family will cherish forever. 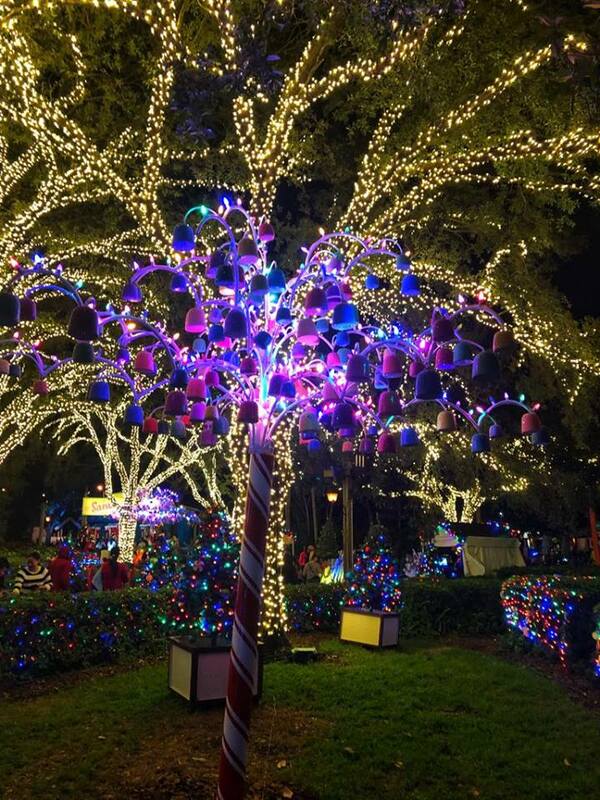 Have you ever visited Busch Gardens Christmas Town? What is your favorite memory? Please leave your thoughts below in the comments section. Please note: I was provided complimentary Busch Gardens Tampa Bay Christmas Town 2018 admission tickets, for myself and up to 4 guests, for the purpose of this honest review. All opinions are my own! This is an excellent post giving information, directions and photos. My favorite area was the tree of bells, beautiful. Thank you.